New technologies are creating new jobs globally. The Salesforce ecosystem alone will create 2 million jobs by 2020—covering a broad spectrum of business and technical career paths. Unfortunately 80% of companies struggle to find skilled talent to fill these jobs. The loss in productivity caused by this skills gap costs companies a staggering $1.3 trillion dollars per year. While students should be a great source of new talent, employers say recent grads don’t have the skills they need. Meanwhile, students are struggling under mountains of debt as tuition costs have increased over 200% in the last 20 years and many graduates aren't able to land lucrative jobs with their degrees. It's easy for industry and academia to finger point over the skills gap. But it's not anyone's fault alone. We are in the midst of the Fourth Industrial Revolution where technology is evolving more rapidly than ever before. The skills employers need are a moving target and it’s difficult for schools to keep up with the pace of innovation in industry. To really solve this skills gap, industry and academia must work together to prepare students for this ever-changing business world. Enter Trailhead. Trailhead empowers everyone to learn the skills they need—regardless of gender, background, culture or lifestyle—to land a job in the workforce of today and tomorrow. By partnering with academia, we can democratize education, empower students and provide equal opportunity for all. We are taking the power of Trailhead, with its guided, hands-on learning paths into the classroom with Trailhead for Students. 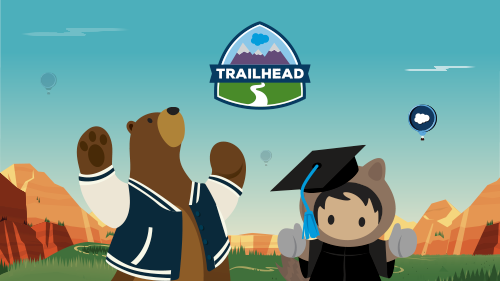 Working together with universities, community colleges, workforce development programs and educational nonprofits, Trailhead for Students provides everything educators need to get students ready for the Salesforce economy. Over 70 educational partners like University of Massachusetts Lowell, Year Up, Jewish Vocational Services (JVS) and University of San Francisco are already making a difference with Trailhead for Students, providing a path to learn new skills, earn resume-worthy credentials and connect with employers to land top jobs. We are also introducing new student-led community groups to help future technology leaders connect and learn Salesforce skills together outside the classroom. 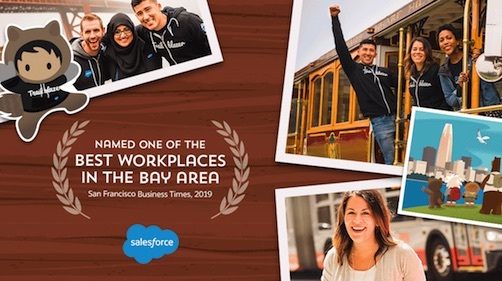 Students now have access to mentorship opportunities from Salesforce employees and Salesforce community leaders who've built incredible careers in tech. 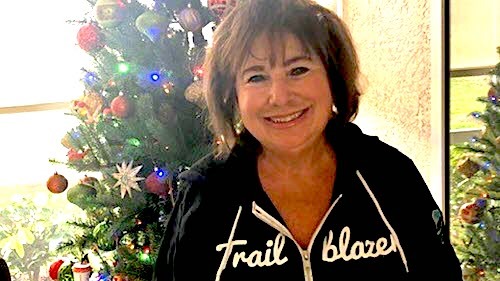 You take the power of Trailhead hands-on learning, add ready-made curriculum and the community of Trailblazers and that is the magic of Trailhead for Students. Access Instructor Kits which include best practice guides, sample class formats, slide decks, and classroom materials—all maintained by Salesforce experts. 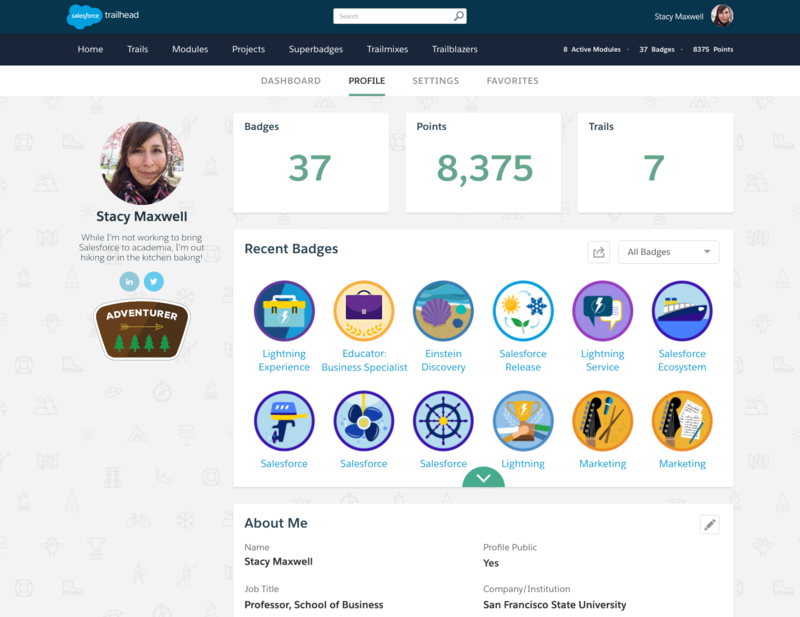 Prepare to teach a course by skilling up with Trailhead, or through an expert-led class and stand out by earning a Trailhead Educator badge to display on their profile. Use Trailhead as a tool in the classroom to track students' progress and reinforce lectures through hands-on labs. Join an online educator community to share tips and tricks and best practices. The University of Massachusetts-Lowell is one of the 70 institutions that have joined the program so far. This summer they trained 60 students and faculty in an online bootcamp and will be including Salesforce into an existing course during the Fall 2017 semester. Learn all the skills they need to be successful. Trailhead provides learning for technical skills, soft skills, and business skills, including how to prepare for an interview and land that first job. Reinvent their resume with Trailhead. They can earn skill-based credentials that prove to employers they can hit the ground running from day one. Get hands-on with a free Salesforce “playground” to hone newly acquired skills in a real-world environment. Become a Salesforce Ambassador on campus or join a new student-led community group. Engage in networking and mentorship opportunities with Salesforce employees and community leaders. Pranav Nagrecha is a senior at UML pursuing an MIS degree. He started learning Salesforce while interning for the University and then participated in a Trailhead summer bootcamp. He signed up to be one of the first Salesforce Ambassadors on campus. If you're new to Salesforce, the Salesforce Essentials for Business Specialists course is an ideal place to start—for educators and students alike. 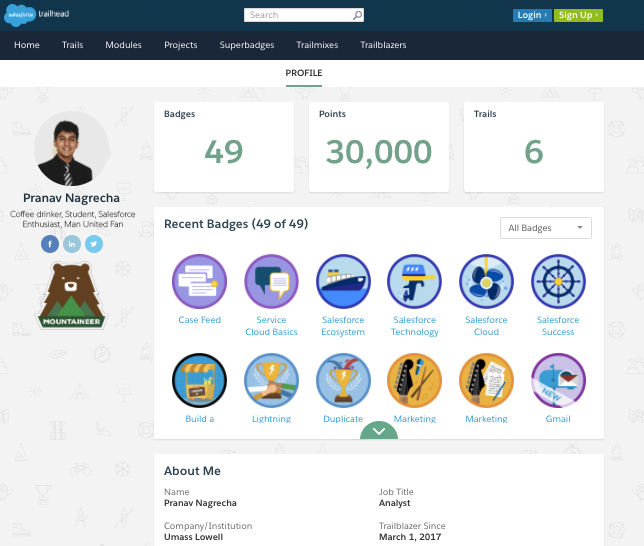 The curriculum is free through Trailhead for Students and focuses on building an understanding of what's possible with the Salesforce Platform, its specific applications, and business values and benefits. Learn more about how Trailhead for Students can provide students with a path to their Salesforce future and a roadmap for educators to help them get there. Pssst! And if you're an educator that has students who are ready to start blazing their own trail, challenge them to conquer new Salesforce skills by earning Trailhead badges between September 18 and October 20th for a chance to win a free student trip to the industry's biggest tech event, Dreamforce 2017 as well as other great prizes! Find all the details here.